Amish builders in Maine have teamed with a non-Amish business to create a “solar shed”. If you didn’t know, many Amish themselves are avid users of solar power, with the sun-guzzling panels visible on homes and barns and even on buggy rooftops. Combining solar with Amish craftsmanship also turns out to be a business opportunity. 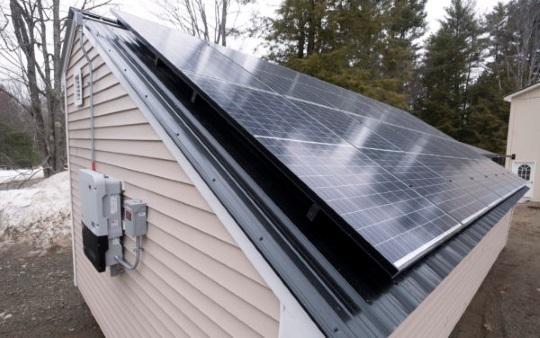 The company Hochstetler manages, a Unity, Maine Amish outfit called Backyard Builders, have partnered with a non-Amish company to create a shed with a roof covered in solar paneling. The article in the Bangor Daily News reads a bit like an advertisement, but it’s a nice example of how Amish businesses evolve and incorporate new ideas to serve an often non-Amish market. 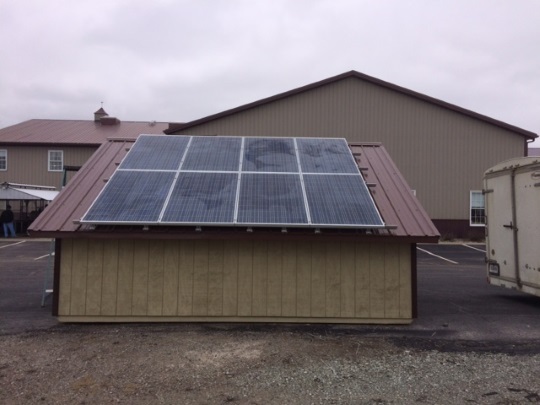 So when Matt Wagner of Insource Renewables approached him in January about teaming up to produce a shed that was equipped with the same solar technology found on traditional roof-mounted systems, Hochstetler was sold. So if you’re into solar, might be a nice thing to have in your backyard. Apparently the panels on the shed can scoop enough solar energy to provide power for your entire home. I’m still not a fan of how solar panels look on a roof (ugly!) so maybe sticking them on a shed in the backyard and a little more out-of-view is the way to go. Also, thanks to companies like Tesla, we’re now seeing more aesthetic solutions like solar tiles that look just like regular roof material. Maybe that’s the next evolution of this idea for the Amish. I WISH someone could hook up my shed to gather solar power! It’s 10′ x 12′ and in the sun most of the day (in spring & summer, at least). I have tried to find “simple” solar instructions (if I could re-charge a battery that runs a small backyard fountain, and provide light/electricity for the shed, I’d be happy.) But from the research I’ve done, solar is expensive to install…I wonder if it would “pay for itself” in what’s left of my lifetime (I’ll be 65 come Fall). What I need is an Amish installation crew nearby—or one that travels the country to do “odd jobs” at a reasonable price! Should we really beware the Amish-made label?